Is everyone enjoying switching between umbrellas and air conditioning? As you plan for the upcoming year, here is a schedule of all our major holidays and events. Online registration is underway for the 2017 Summer Session. Find classes and activities for students in grades 5 through high school and register online today. Students in grades 7-10 will register for courses for the 2017-2018 school year after they return from Spring Break. Sign-up sheets will be sent home with students. Juniors have already received their sign-up sheets. If you have any questions about this process, contact Todd Frost. All students taking an AP exam are required to drop in to one of the pre-administration sessions on April 11 and 12 in the library study rooms. *Note: the date has been adjusted. Students will not be allowed to test without completing this process. Please contact Amanda Lem with any questions. The Detoy Award annually celebrates the accomplishments of a distinguished member of the faculty, administration or staff of Flintridge Prep for outstanding personal and professional contributions to the school. An employee with five years service to the school is eligible. Awardees receive $5,000 and are honored publicly. Recent winners include: Raj Wahi (2016), Madeline Barraclough (2015), Mary Ellen Jamison (2014), Joanna Hartigan (2013) and Sylvie Andrews (2012). Any teacher, administrator, staff member, current parent, student or alumnus may submit a nomination to the Awards Committee. The signed nomination should be at least one full paragraph explaining the unique qualities and contributions of the candidate. All nominations should be considered confidential. Please submit your nomination by April 28, 2017 by emailing your nomination to Peter Bachmann or by dropping it by his office. If you have any questions, please call Mrs. Woolley at (818) 949-5513. Read the latest installment of “Conversations in Education,” a blog for parents that organizes interesting topics in education. You can find the blog, which is published monthly, by clicking here or by visiting the Parents Portal. From the blog page, you can subscribe by clicking the blue Alerts button at the top of the page. If you want to share your ideas, feel free to comment on an individual post or contact Dean of Studies Sarah Cooper. PrepFest, Student Senate's biennial film and arts festival, is just around the corner. Join us on Saturday, April 1, from 4:00 to 7:00 pm to enjoy tacos from Los Gringos Locos, in addition to performances, art and films, all brought to you by Prep's amazing artists. All parents and students are welcome to attend! Tickets will be sold the week before the event during lunch for $10 and at the door for $15. Food is included in the ticket price. Hope to see you all there! On Sunday, April 2, at 5:00 pm, Oneonta Congregational Church (1515 Garfield Avenue, South Pasadena) will present a free South Pasadena Ecumenical Lenten Community Concert entitled “Songs of the Spirit.” The concert features the Flintridge Singers along with the Oneonta Chancel Choir and Soloists, The LA Community Youth Choir and Laudate; Cellist Mark Salzman; Bassist Jon Murray; and a special jazz trio featuring LA’s finest jazz musicians, under the direction of Steve Hill and accompanied by William Schmidt. Mark your calendars: Wednesday, April 12, is Prep's 25th Annual Spring Music concert. This concert features the Flintridge Singers and Prep's orchestra. The concert begins at 7:00 pm in Norris Auditorium. On Saturday, April 29, share an evening of jazz, coffee and goodies with Prep's jazz ensembles at the Jazz Coffee House. This performance begins at 6:00 pm in the Miller Theater. Admission to all of the music concerts is free. Grandparents and Special Friends Day is Thursday, April 13, and all 7th-10th grade grandparents and special friends are invited to attend. Continental breakfast begins at 9:30 am, and the day includes classes and lunch with your student, as well as a special performance from Little Shop of Horrors. No need to RSVP, but if you have questions, Contact Barbara Ealy by email or phone at 818.949.5522. Parking will be available in the Crown Avenue lot. Junior/Senior Prom is Thursday, April 13, 7:00 pm-12:00 am. This exhibition showcases the variety and versatility of Prep student projects over the past four years. By introducing our ceramics program to the community, we hope to start a conversation about Prep’s unique approach to ceramics as a form of creative expression, how our curriculum compares to others in the region and the value of high school art programs in general. The exhibition will run from April 15 through June 3. The Prep Dance Department will present not one, but two performances of the spring dance concert, "A Night at the Museum" on Friday, April 21 and Saturday, April 22. A girl is accidentally locked in a museum for a night and uncovers the magic of moving paintings, twirling sculptures, living exhibits and even an attempted art heist! Both shows start at 7:30 pm, and admission is free. On Friday, April 28, at 7:00 pm, seniors and parents are invited to Senior Celebration in Norris Auditorium. There will be a reception with light refreshments followed by the pinning ceremony. Seniors, come wearing your college colors! On Saturday, April 29, the ACL will host the Special Olympics Western Regionals on Prep’s campus with over 150 athletes competing in aquatics and basketball. Opening ceremonies begin at 8:30 am. The ACL will be taking all volunteers interested in helping during the day’s event. You can either check in at the Special Olympics booth at 8:00 am or contact Alex Rivera. On Monday, May 1, we welcome all parents, faculty and alumni to attend the annual Flintridge Prep Golf Tournament, Silent Auction, Wine Tasting and Dinner. Event proceeds benefit the John Plumb '64 Endowment Fund for Faculty Enrichment. Teachers use these funds to study an amazing array of topics that advance their teaching. For more information, email John Brown. To purchase event tickets, click here. The girls soccer team had a historic season, as they qualified for the State tournament in Tulare and won their first game there. They lost in the regional semifinals versus the eventual champion, South Torrance. 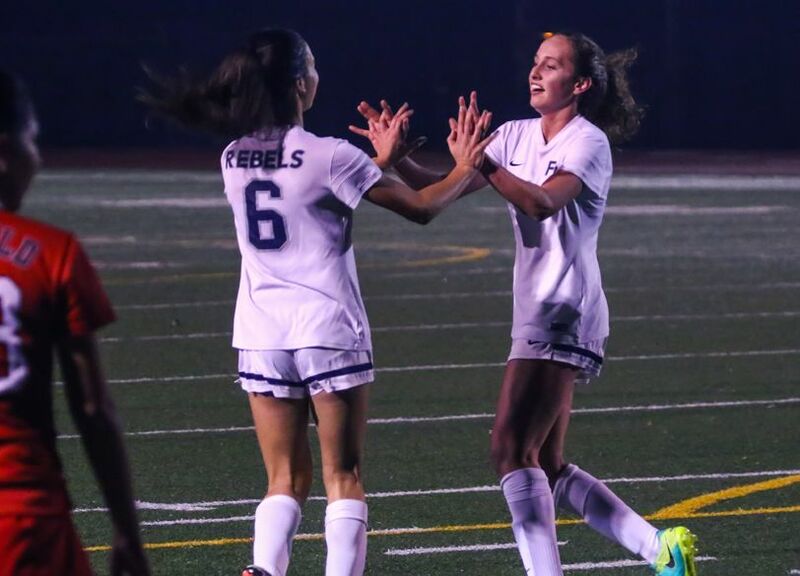 Prep League titles were won by girls and boys soccer and girls basketball, all advancing to the CIF playoffs, along with boys basketball. Now, the spring sports are in full swing. Come out and support the Prep athletes! The ACL wants to thank everyone for supporting the La Mascota 5K Run/Walk at Griffith Park. Over 400 runners participated in the event, along with many vendors contributing to the cause, raising money for La Mascota Hospital, the only pediatric cancer hospital in Nicaragua. Hanna Barakat ’17 and Willow Scott ’17 spearheaded the event, along with all ACL members and many volunteers from the Prep community. In our next letter, we will announce how much was raised for La Mascota Hospital. Guest Speaker: Kathy Robinson Young, Daughter of Mack Robinson, who placed 2nd in the 100 yards in the 1936 Olympics in Germany (Jesse Owens placed 1st) and niece of Jackie Robinson of the Brooklyn Dodgers. We welcome the community to come hear our speaker in the library. Special Olympics, hosting basketball and swimming events with Opening ceremonies starting at 8:30 am, we welcome all volunteers for the event. College admission decisions will begin to trickle out mid-month. This is an exciting time of year! In our office, we begin to feel bittersweet about how far we’ve come with our seniors and excited to see what their future holds. Seniors, please carefully read the offer of admission from your college of choice and inform your college counselor of your outcomes. Counselors will begin to schedule meetings with seniors in April to review their options. Once a senior has decided on a college, it is imperative to pay your deposit on time. You may only submit an enrollment deposit to one college; submitting a deposit to more than one institution is unethical and may jeopardize admission opportunities at both schools. Seniors who are wait-listed by their first-choice college must see their college counselor by April 15. Juniors interested in attending the College Essay Writing Boot Camp on June 8 and 9 from 9:00 am to 2:00 pm can register here. Juniors and sophomores should register for Subject Tests by May 5 for the June 3 sitting date. We strongly recommend all juniors register for either the April ACT or May SAT if they have not yet tested. Visit www.act.org or www.collegeboard.org to register. On Tuesday, April 25, at 7:00 pm, all juniors and their parents are invited to attend the annual Case Studies Program at the Westridge School. Each parent will receive a copy of the program materials by mail. Please bring the packet with you to the event. If you do not receive the mailing, please contact Amanda Lem or call (818) 949-5510. On Friday, April 7, Manny and Jane Abascal will host our annual New Dads Mixer at their residence in Altadena. This mixer introduces new incoming dads to the Prep community and shares how the Fathers Club supports the school through volunteering efforts and initiatives. For more information, email Eric Panajotovic. Dads, click here to RSVP. On Monday, April 17, dads are welcome to join our final Fathers Club meeting of the school year in Prep’s Chandramohan Library. You will want to Save the Date for a very interactive and memorable evening. The next Parents Association meeting will be held April 11 at 8:15 am at La Cañada Flintridge Country Club. Our guest speaker, Science Department Chair Laura Kaufman, will discuss Prep’s STEAM program. We will also be voting on the 2016-2017 Executive Board slate. Big thank you to Parliamentarian Susan Rossi for leading the nominating committee. The Flintridge Fever co-chairs Monique Stevens and Christine Lee, and all committee members, dazzled the community with a record breaking fundraising event. Thank you to everyone who attended the spectacular evening. You helped raise funds for our new atrium project, which will benefit the entire Prep community. We also had a fantastic turnout for our second Annual Flintridge Prep Speaker Series with guest speaker Peter Gray discussing Declining Resilience among Adolescents. A special thanks goes out to Laura Campobasso and her committee for providing an evening of meaningful engagement in support of Prep’s commitment to lifelong learning. The Parents Association sent you a survey requesting your feedback. The survey will take just five minutes to complete and will help us to shape the future of the Parents Association. All parents are welcome to participate, and we will collect input through March 31. Thank you to the many families who have generously supported the Annual Fund. Parent participation for the Annual Fund has reached 80%. A parent participation rate of 100% is our goal and is the vital factor that foundations look at as we pursue grants. We need and appreciate everyone’s support. Visit our online donation page today. Congratulations to everyone who helped out and performed in the musical Little Shop of Horrors! It was an incredible show, and everyone had a great time making it happen and watching it come to life. Please enjoy the rest of spring break.